Heat the water in a small pan. Add the garlic and gently simmer for a few minutes. Discard the water and crush the garlic. Put the crushed garlic, olive oil, salt and lime juice into a bowl and mix till they are well combined. Cook the toast and top with the avocado. 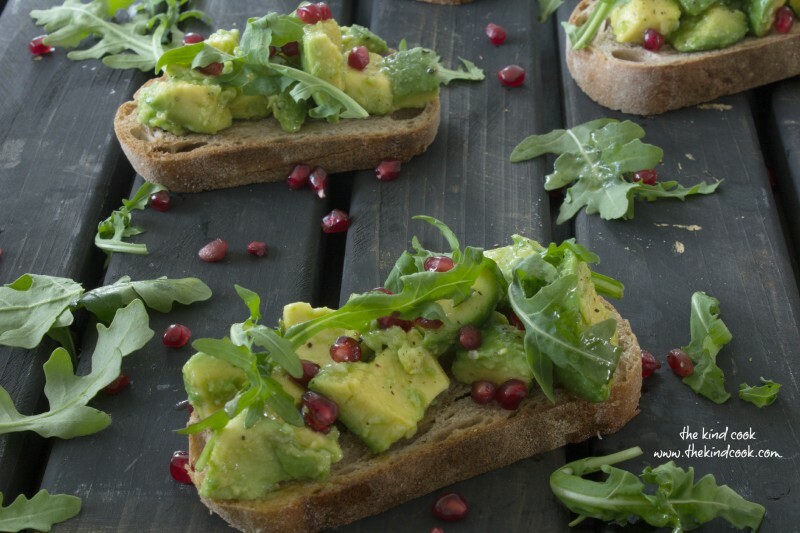 Garnish with the rocket and pomegranate seeds and finish with a generous amount of cracked black pepper over the top. Notes: There are not many components to this simple dish, so good quality ingredients such as a good olive oil, rock salt, fresh garlic and lime juice and crisp washed baby rocket all make a difference. I usually take the time to cook garlic for a few minutes for recipes like this. It removes that harsh astringent taste raw garlic can have.